The Trust’s plans for the redevelopment of St Ann’s Hospital in Haringey are progressing rapidly following final approval by NHS Improvement in October 2018. The plans agreed with patients, staff and local stakeholders involve a series of improvements to the health facilities, which will occupy just over one third of the site, along with a residential development to create new family houses and flats for local people. These will include both private and affordable homes. St Ann’s will not close, the current health services will remain, but be provided in improved facilities, including a new, state-of the-art, mental health inpatient building to replace the current poor quality mental health wards on the site. 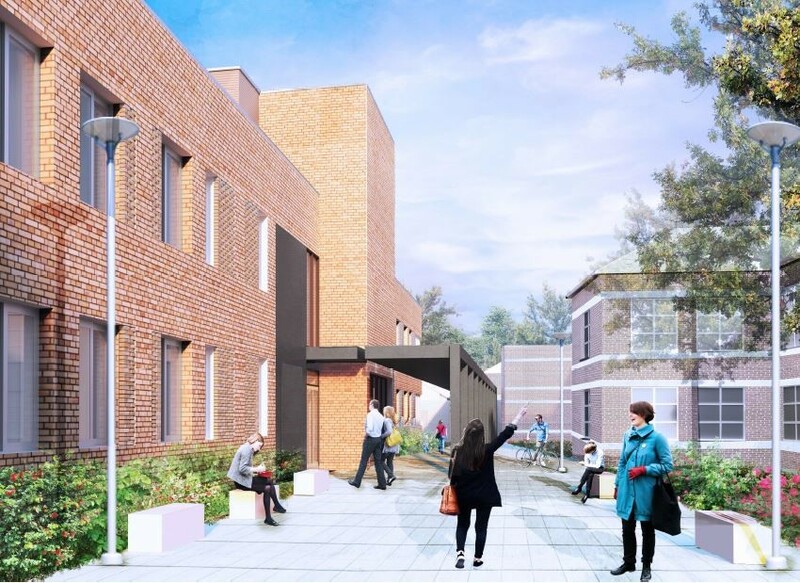 The Trust received full Planning approval in March 2018 from Haringey Council for the new mental health inpatient building, to replace the current three adult mental health wards and the specialist eating disorders ward. This follows a lot of work with patients, carers and staff and the Trust’s design and build partner, Integrated Health Projects. Construction of the new mental health building has begun with completion by early 2021. This is very exciting news for the Trust, its patients and staff. It means that the current wards at St Ann’s Hospital will be replaced by brand new, state-of-the-art facilities, which will be amongst the best in the country, as shown in the images below. The proposed residential development on the part of the site surplus to NHS needs is also progressing following the sale of the surplus land to the Greater London Authority (GLA) in March 2018. The GLA will develop the surplus land for housing, with at least 50% of the new homes being designated as affordable housing. 22 of the flats to be built will be available to the Trust to use to help recruit clinical staff. As preparations for the new inpatient building develop, there will be some changes to the road layout. Temporary parking areas will be provided, so that the impact on patient, visitor and staff parking is minimised. Following the sale of the surplus land to the GLA, the Trust is leasing back some of site to continue to provide services, until the new mental health inpatient building is built. Once this is completed in early 2021, the current wards will move into the new facilities. This will then free the current ward buildings, which will be refurbished. The Trust’s other clinical and corporate services in the original 1930s blocks will then relocate into the refurbished accommodation by 2023, which will release the final part of the surplus land for residential development. Following completion of Phase 1, the new mental health inpatient building, in August 2020, the current wards will relocate into the new, state of the art block. This will allow Phase 2 to commence by autumn 2020 and be completed by late 2022. Phase 2 involves a number of other significant improvements to the hospital campus including the refurbishment of the current wards for a number of patient services and support staff accommodation, the construction of a new staff restaurant and staff training / education facilities, improvements to G and H Blocks and a range of other site infrastructure improvements including revised roadways and car parking. It will also include constructing a new Estates and Facilities yard on the retained part of the hospital site to enable the Trust to vacate the part of the site sold to the Greater London Authority (GLA). The Trust is currently in the process of appointing a contractor for Phase 2, who should be in place by May 2019. Detailed design work for Phase 2 will commence by autumn 2019 and run until mid 2020, with discussions with those services affected about their future requirements. These will be led by the Project Team, who will make the necessary arrangements over the coming months. The Phase 2 planning work will take time, no final decisions will be made until 2020, with work commencing in autumn 2020 for two years. The Project Team will keep those areas affected updated on progress as we move forward. Phase 2, once completed in late 2022, will bring major improvements for patients, visitors and staff. Although the construction programme is causing some inconveniences in the short term, it will be worthwhile in the long term, with a new hospital we can all be really proud of.